I love to take online art classes! I have taken many different ones over the years. I like the flexibility they give me. I like classes that let me watch the video lessons anytime I want. One of the first online art classes I did years ago was from Laure Ferlita. I fell in love with her Imaginary Trip classes. Her classes continue to be some of my favorites. 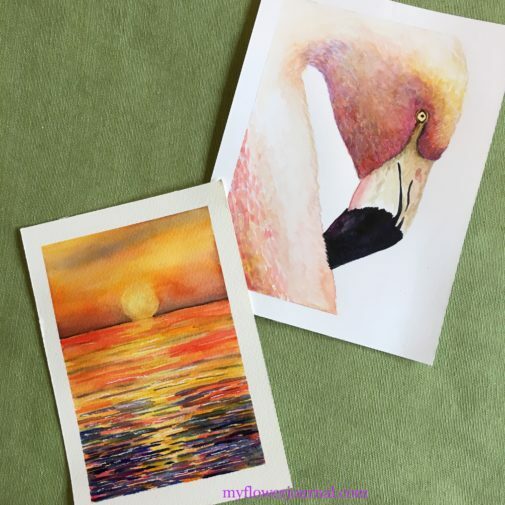 She recently added two mini watercolor classes to the other online classes she offers: Paint a Fabulous Flamingo and and Paint a Fiery Sunset. I hope she offers more like this in the future. Each one took me about two hours from start to finish and cost $10. It was nice to do a class I could do in one sitting. In her video lessons she gives very clear step by step instructions. I watched videos all the way through first then painted along as I watched them the second time. It was easy to pause the video while I worked on each step before going on to the next technique. In addition to the videos she includes a pdf handout that you can download ahead of time that gives details on the supplies you will need, the reference photo and written instructions. 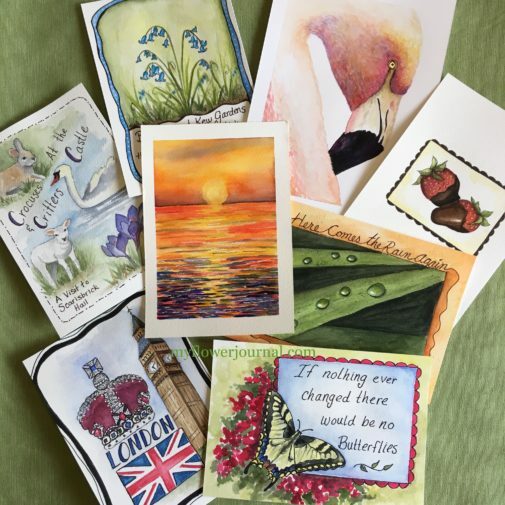 Here are some of the many watercolor journal pages I have done while taking her classes. Some of these pages are from an “Imaginary Trip To England” class I did with her years ago. Its still one of my favorites. 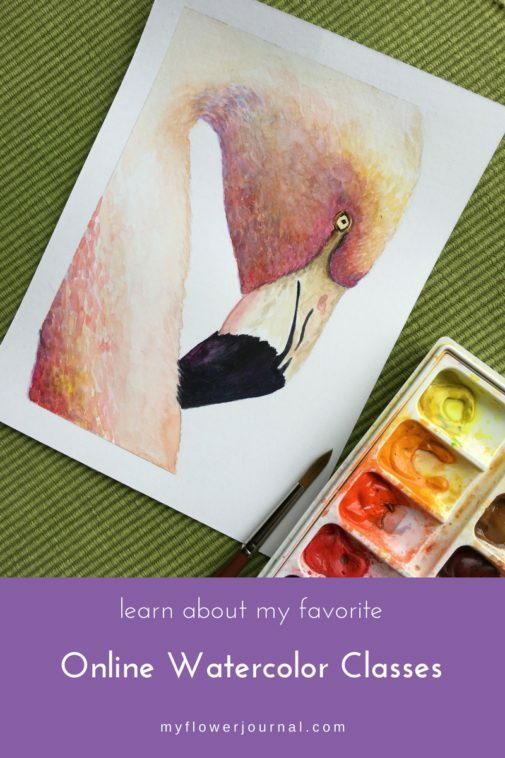 The way she has structured her classes a beginner or advanced student will come away with a piece of art they will be proud of and some new ideas and techniques that can be used on future watercolor projects. I just downloaded Laura’s fiery sunset class to show my 87 year old mom who is now suffering from severe hip pain. I think this class will be just the thing to cheer her up. Thank you for your amazing blog and willingness to share you gifts and your life with us!! Thanks Judy! I hope your mom enjoys the class.